In the spring of 1990 a friend of mine was getting his vintage machine ready for Dayonta Bike. Bike Week with that? I thought that was all about fat people with tats on Harleys. Apparently the classic/vintage movement had taken hold centered around the vintage races at the speedway and Jerry Wood's auction at the armory. Both of which had large well attended bike shows. Hmmm, been thinking about something a little more agile and refined than this HD FXR, so we'll kill two birds with one stone. Create an over the top overly shiny machine and learn just how far down the condition food chain I could go and still resusitate a machine to some semblance of glory. A very important educational process now as I'd discovered the world of Indian Fours at that point and they were hugely expensive in any condition. So, mention of this quest to my good friend, Leo Goff, the last word in Nortons, yielded a very good starting point. 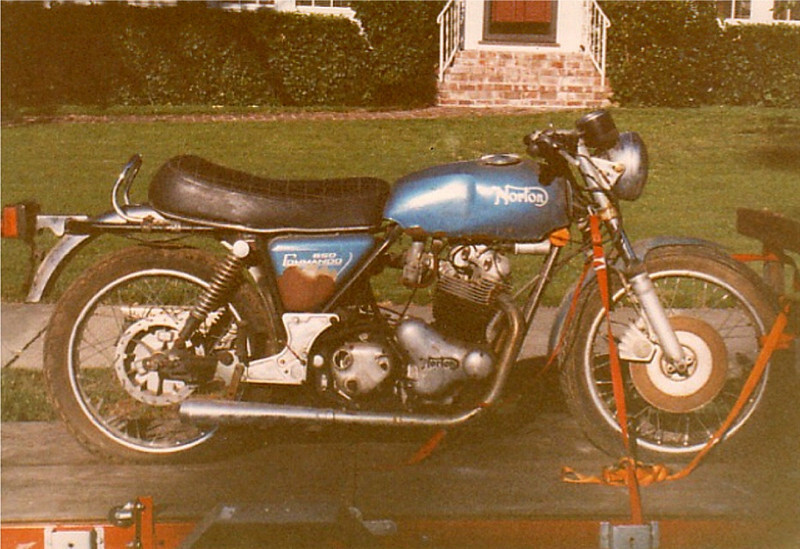 A $750 1974 Norton Commando, all original and with only 1,400 miles on it, parked in a shed and now rather crusty. My objective was to build a very fast Norvil replica with some unique features of my own, mainly that I would not paint it, rather, develop a technique to polish out the bare gelcoat to a finish like cleared polyurethane. Very unmolested missing only the air cleaner assembly, tool roll and primary cover.